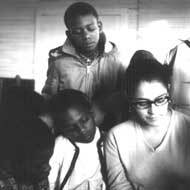 These are snapshots I took in the winter of 1964-65 in some of our Jackson Mississippi Freedom School sessions, at churches and in our 852 Short Street library, and a few portraits of some of our “regulars” in nearby settings. The class leader and storyteller is Viki Ortiz. This was the house at 852 Short Street in Jackson that the Freedom Library shared with the Mississippi Freedom Democratic Party office. Photos copyright © 1965 Martin Nicolaus. Noncommercial use permitted.